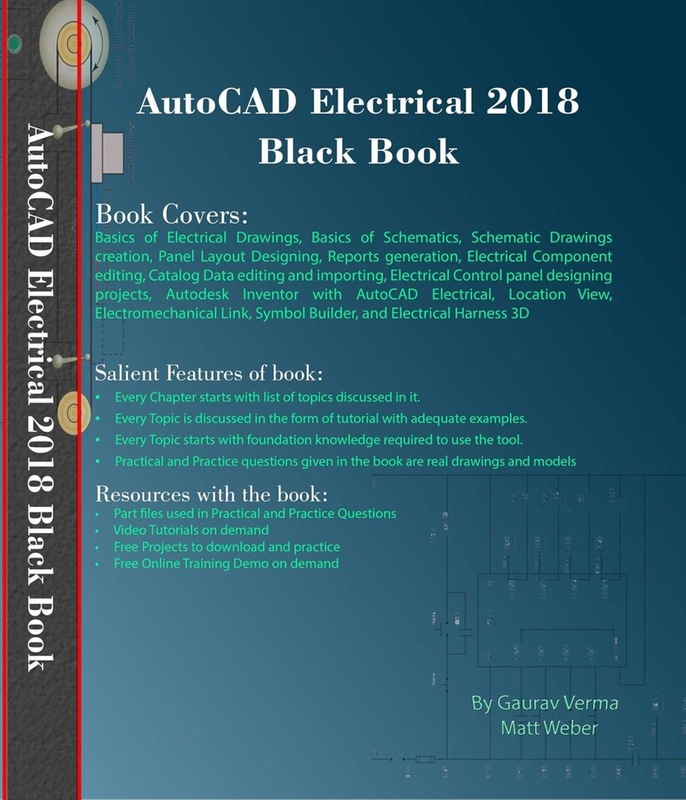 The AutoCAD Electrical 2018 Black Book, the fourth edition of AutoCAD Electrical Black book, has been updated as per the enhancements in the AutoCAD Electrical 2018. Following the same strategy as for the previous edition, the book is written to help professionals as well as learners in performing various tedious jobs in Electrical control designing. The book follows a step by step methodology. It covers almost all the information required by a learner to master the AutoCAD Electrical. The book starts with basics of Electrical Designing, goes through all the Electrical controls related tools and ends up with practical examples of electrical schematic and panel designing. Chapter on Reports makes you comfortable in creating and editing electrical component reports. We have also discusses the interoperability between Autodesk Inventor and AutoCAD Electrical which is need of industry these days. In this edition, we have added practical examples and a project for practice. We have tried to improve the language of book based on the reviews we got. Some of the salient features of this book are : In-Depth explanation of concepts Every new topic of this book starts with the explanation of the basic concepts. In this way, the user becomes capable of relating the things with real world. Topics Covered Every chapter starts with a list of topics being covered in that chapter. In this way, the user can easy find the topic of his/her interest easily. Instruction through illustration The instructions to perform any action are provided by maximum number of illustrations so that the user can perform the actions discussed in the book easily and effectively. There are about 1000 small and large illustrations that make the learning process effective. Tutorial point of view At the end of concept’s explanation, the tutorial make the understanding of users firm and long lasting. After discussion of all the related tools, book has tutorials that are real world projects. Moreover most of the tools in this book are discussed in the form of tutorials. Project Free projects and exercises are provided to students for practicing. For Faculty If you are a faculty member, then you can ask for video tutorials on any of the topic, exercise, tutorial, or concept. 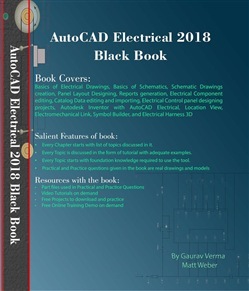 Acquista AutoCAD Electrical 2018 Black Book in Epub: dopo aver letto l’ebook AutoCAD Electrical 2018 Black Book di Matt Weber, Gaurav Verma ti invitiamo a lasciarci una Recensione qui sotto: sarà utile agli utenti che non abbiano ancora letto questo libro e che vogliano avere delle opinioni altrui. L’opinione su di un libro è molto soggettiva e per questo leggere eventuali recensioni negative non ci dovrà frenare dall’acquisto, anzi dovrà spingerci ad acquistare il libro in fretta per poter dire la nostra ed eventualmente smentire quanto commentato da altri, contribuendo ad arricchire più possibile i commenti e dare sempre più spunti di confronto al pubblico online.